H!P - Hello Non-Pro Hour: Tsunku, Yaguchi Mari and Iida Kaori in Politics..... ?! Tsunku, Yaguchi Mari and Iida Kaori in Politics..... ?! 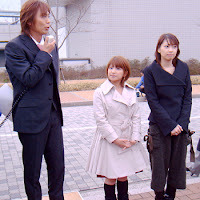 Later I found out that Tsunku, Yaguchi Mari and Iida Kaori are part of the supporting team for the mayor election in Kyushuu. Source from WHG. Now I hold nothing against what they are doing... but just where the heck is the connection?! 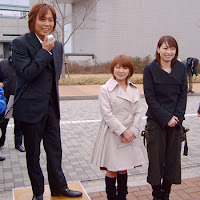 Tsunku is from Osaka, Marippe is from Kanagawa and Kaorin is from Hokkaidou. Is Tsunku's appetite for exposure that strong, so as to be affiliated with politics as well? It's fine that Hello! Project participates in various promotions of other merchandise and public campaigns. But does Tsunku intend to allow Hello! Project to be available for bookings in political activities as well? .... I don't know what else to say. Nice exclusive! 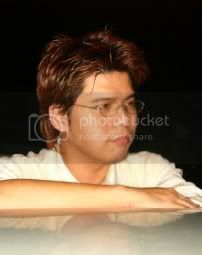 It could well be that Tsunku and his H!P colleagues were simply paid to endorse this guy. It's been done before. Remember that the vary true intention of music is comunicate feelings, emotions and ideals. Those are not old pictures. That event just happened a week ago. Just check Mari's and Kaori's pages in Japanese Wikipedia. Just because they're idols doesn't mean they are only ever in the public eye for their job. Sure it could be Tsunku telling H!P they have to appear at an event he wants invovement in, but it could just as easily be 3 people who all want to support the same political party. heehe they both kinda look like their old momusu days...but yeh marippe just got that hairstyle a while ago so it aint old. ...she went back to her old hairstyle sometime some time in January. The hairstyle has also started to appear on her two weekly shows, as they work through their backlog of previously taped segments. The jury is out on whether it's a good or bad move. Sure, she looked more mature and elegant with the long, dark hair (almost matronly, if you include the extra weight and the crocheted shawls), but I'm guessing she also lost a big chunk of her recognizability. -This- is the Mari that the general public remembers from a few years ago. The same goes for Kaorin: notice that she's growing her hair out again. My hunch is that management finally realized they were diluting the brand too much and losing their mainstream (i.e., non-wota) fanbase. The 10th Anniversary campaign is their effort to reconsolidate the brand, and that includes asking the graduates to come back and help out.